Crossvine is a woody, native vine that is tamely aggressive compared to its cousin, trumpet vine (Campsis radicans). The original native is golden yellow with magenta center. Cultivar ‘Tangerine Beauty’ is orange with yellow center. Crossvine does grow quite vigorously, but it doesn’t sneak over into your entire landscape and try to take over the neighborhood like trumpet vine. It can grow up to 50’ feet long, so is perfect to cover a fence, sturdy trellis or arbor. It is native to Texas and the Southeastern U.S. ‘Tangerine Beauty’ is a specific variety that puts on a fabulous spring show followed by sporadic flowering the rest of the year. Plant in sun to part shade in just about any soil. It needs little water once it’s established. 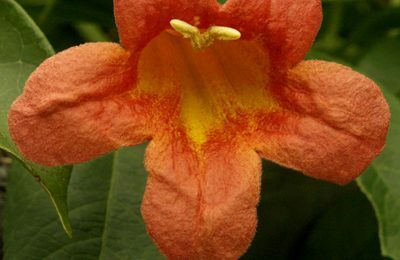 Tubular flowers appear spring and sometimes in fall to attract hummingbirds and butterflies. Considered a semi-evergreen, crossvine keeps its leaves through winter, only dropping them in spring, just before putting on new ones. It blooms on old wood so prune soon after flowering to shape and encourage new growth and later flowers. Like any vine, it will take a few years to take over!